Marshall Masayesva. Photo courtesy Adventures for Hopi. While he was growing up on the arid, remote Hopi Nation in northern Arizona, Marshall Masayesva never paddled a kayak or went backpacking. People who lived in his community spent a lot of time outdoors, but the term "recreation" was seldom uttered; Masayesva never thought of himself as an outdoors person. That began to change after high school when Masayesva's sister encouraged him to get a job in the conservation field. "She wanted me leave the reservation, so she threw an application at me," he says. It was for a Flagstaff-based conservation corps, and Masayesva was accepted into the program. That summer, he was stationed near treeline on the San Francisco Peaks for a month, living out of a tent and doing hard, physical trail work in what he describes as an "intense backcountry" setting. "That experience completely blew my mind and opened up doors to the recreation world," Masayesva remembers. What's more, it came with an AmeriCorps education scholarship, which encouraged Masayesva, who hadn't planned on going back to school, to enroll in Fort Lewis College in Colorado where he began working on a biology degree. Between semesters, Masayesva continued to do trail work with the Rocky Mountain Youth Corps, and he spent a summer on a Southwest Conservation Corps chainsaw-crew cutting out invasive tamarisk on the Dolores River. He loved the work, but he was struggling to keep up in school, especially in the math classes required for his biology major. Around his junior year, he briefly dropped out. When he returned to Fort Lewis, Masayesva was looking for something new, and he signed up for a course called Adventure Education 101. The professor held a discussion on experiential education during the first session that led to another epiphany for Masayesva: the conservation work he found so inspirational had a well-developed educational philosophy behind it. He filed the paperwork to change his major to Adventure Education that afternoon. "I knew I would come home and start a program," says Masayesva. After graduating in 2014, he moved back to Hopi and began fundraising to start a recreation-based service learning program on the reservation. Adventures for Hopi courtesy photo. The idea was slow to catch on. Masayesva scraped together some gear and planned a few trips under the name of this new organization, Adventures for Hopi (A4H). He had learned to kayak and rock climb in his Adventure Education classes, and his first advertisements for youth courses used the kinds of recruitment images that are common in the recreation community: climbers dangling off cliff faces or friends high-fiving at the summit of an alpine peak. "I didn't understand why," Masayesva says. "That's how people market recreation." He slowly came to understand that parents were turned off by what they considered to be unnecessary dangers of extreme sports, and he eventually retooled his marketing to make it more culturally appropriate. "Recreation has always been kind of a white man's thing," he says. "'Why?' was the biggest question I got [from parents]. ‘Why would you want to go and conquer that mountain? Why would you want to go and suffer and do all of these crazy things? You have responsibilities. You have work you have to do.’"
Masayesva led a few hiking trips and discovered that the social aspect of outdoor education resonated on Hopi more than the adventure. "I had to build it as a way of not focusing on the individual," he says. "I took a lot of the extreme sports aspect out of it and started plugging in more of the social and educational components — and I got a lot more interest." The organization has grown steadily in the years since. In 2015, A4H went up against two well-established nonprofits in the second round of a competition for a $10,000 grant from the footwear company Keen. The competition required people to vote on Keen's website, and Masayesva, who was working construction at the time, didn't have much hope that his fledgling organization could pull off the win. On the last day of the competition, A4H was still behind, but Masayesva saw the gap closing. He asked his fellow construction workers to text everyone they knew. The build was put on hold while they rallied a final effort, and in the last few minutes, A4H pulled ahead by 26 votes. That grant was a turning point. It allowed Masayesva to purchase a kayak fleet and other gear. He helped train his volunteer guides and get them certified as Wilderness First Responders. 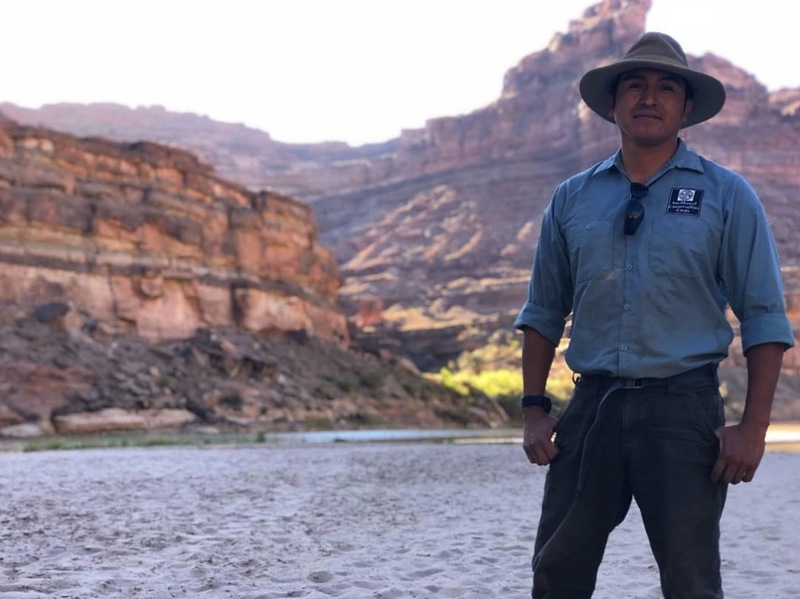 Late in 2017, Masayesva partnered with Southwest Conservation Corps’ Ancestral Lands program, where he now serves as the Program Coordinator for Ancestral Lands Hopi. Through that partnership, Masayesva began organizing conservation work crews on public lands around Utah and Arizona and incorporating elements of A4H’s recreation programming. 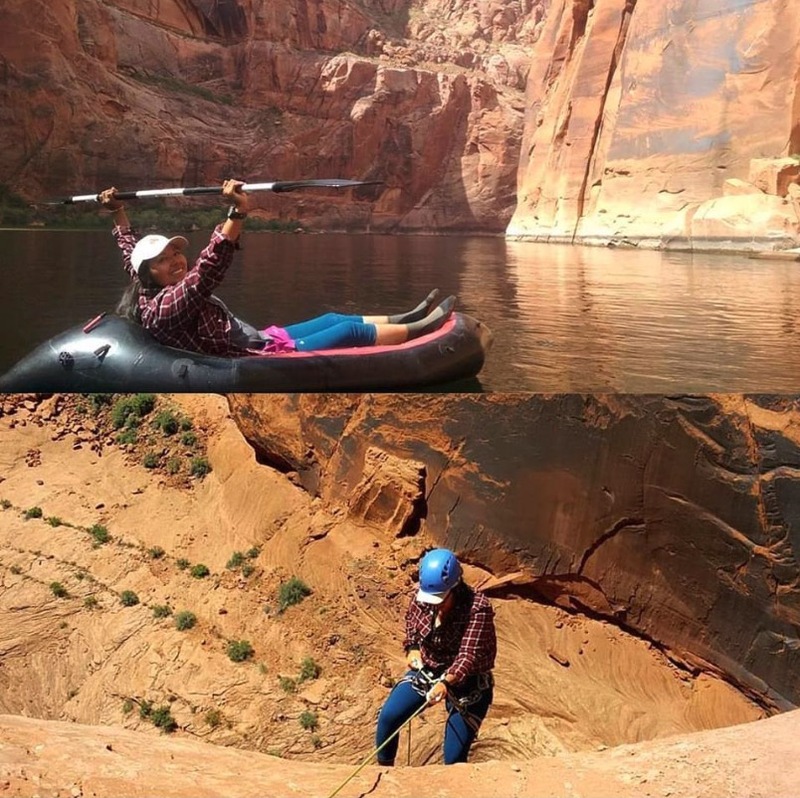 Adventures for Hopi clean-up crew on Clear Creek Reservoir. Courtesy photo. Over the last several years, the melding of Ancestral Lands Hopi and A4H has led to increased conservation work and recreation offerings. Masayesva helped organize a three-day cleanup with Petrified Forest National Park in Arizona that brought together 40 Native youth from five tribes. They paddled kayaks across the Clear Creek Reservoir to clean up trash and remove graffiti. Ancestral Lands Hopi offers longer river restoration and archaeology preservation programs, which provide participants with a stipend and AmeriCorps education grants like the one Masayesva received to attend college. Drawing from A4H’s recreational mission, Masayesva tries to work in backcountry adventures as well. 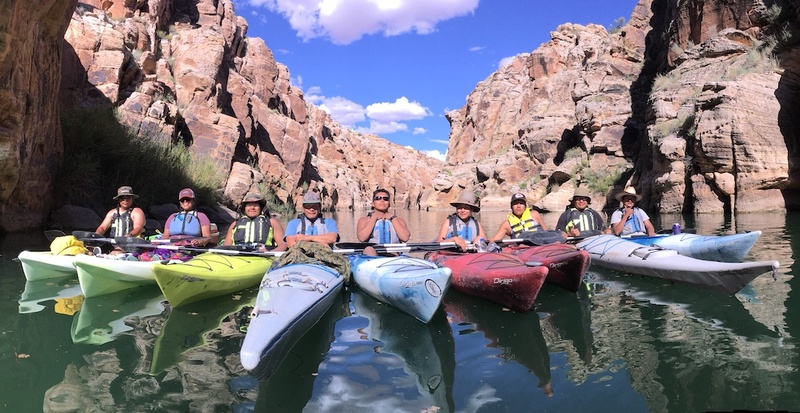 After his crews finish work hitches removing invasive Russian olive trees on the Utah’s Escalante River, for example, Masayesva rewards them with an overnight kayak trip on Lake Powell. Masayesva is currently ironing out the details of a 2019 partnership between Glen Canyon National Recreation Area, Grand Canyon Youth, Ancestral Lands Hopi, and A4H. He expects to hire a raft-supported invasive species removal crew of Hopi youth who will spend part of their nine-month term taking out tamarisk on the San Juan, Colorado, Dirty Devil, and Escalante rivers in southern Utah. Like with all of his programs, he hopes to create opportunities on the reservation where participants take away important life lessons while performing useful work on public lands. "Experiential education is pretty much traditional education; it's just had a fancy word slapped over the top of it," Masayesva says, looking back on the Adventure Education class that inspired A4H. "That's how Native people learned a long time ago — we were outside all the time. It wasn't a high philosophical concept, it was just life. I try to meld the educational programs around that idea, and I'm trying to plug in educational, cultural lessons." — Support Adventures for Hopi and follow them on Facebook. And learn more about Masayesva’s other project, Ancestral Lands Hopi.